Bio fuels are liquid or gaseous fuels produced from biomass resources and used in place of, or in addition to, diesel, petrol or other fossil fuels for transport, stationary, portable and other applications. Why we need Bio fuels? India’s Energy Security: India’s energy security would remain vulnerable until alternative fuels to substitute petro-based fuels are developed. Socio-Economic Development: Energy is a critical input for socio-economic development. Availability: Conventional or fossil fuel resources are limited, non-renewable, polluting. Resources: India is endowed with abundant renewable energy resources. Price:The crude oil price has been fluctuating in the world market leading to instability in an economy. 1948- Power Alcohol Act: The main objective was to use ethanol from molasses to blend with petrol to bring down the price of sugar, trim wastage of molasses and reduce dependence on petrol imports. 2003: The Government of India launched the Ethanol Blended Petrol Programme (EBPP) in nine States and four Union Territories promoting the use of ethanol for blending with gasoline and the use of biodiesel derived from non-edible oils for blending with diesel (5% blending). 2003-National Mission on Biodiesel was launched by the Government to achieve 20% biodiesel blends by 2011–2012. It identified Jatropha carcass as the most suitable tree-borne oilseed for biodiesel production. Policy did not address production of domestic feedstock for Biofuel such as (molasses a by-product of sugar production) is the main raw material for ethanol in India. Because of supply shortages and global concerns over food security the Biofuel programs experienced setback. Lack of Government support in terms of taxes and other infant farm industry incentives. 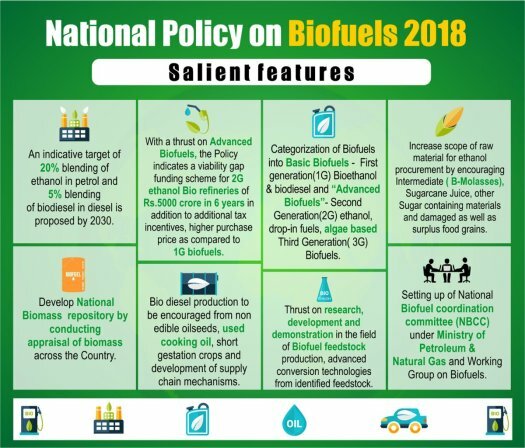 To address the issues, Government has enacted National Policy to Biofuel in 2018. Goal: Achieve 20% blending of ethanol in petrol and 5% blending of biodiesel in diesel is proposed by 2030. Development of new technologies for conversion to biofuels. Creating suitable environment for biofuels and its integration with the main fuels. Other biofuels, such as jatropha, have often proven to be commercially unviable. Achieving 20% blend rate would require India to divert an extra one-tenth of its net sown area towards sugarcane. Any such land requirement is likely to put a stress on other crops and has the potential to increase food prices. Efforts taken to achieve Biofuel production could lead to food security and strain water resources. The policy is totally silent on octane (which is blended with petrol) which has direct consequences of air quality and pollution. The policy advocates the use of untested technologies like the production of 2G ethanol. Relying technology which is commercially untested is not a viable option. According to critics, the ways in which companies are selected to develop and boost Biofuel in India is not transparent. Government plans to set up 12 modern biofuel refineries across the country. It has set a target to save Rs. 12,000 crores in the next four years by the use of ethanol. Since 1976, the Brazilian government made it mandatory to blend anhydrous ethanol with gasoline, fluctuating between 10% and 25%. However, in 2017, it raised blending of ethanol to gasoline to 27%. In 2010, Environment Protection Agency (EPA) designated Brazilian sugarcane ethanol as an advanced Biofuel due to its 61% reduction of total life cycle greenhouse gas emissions. Brazil has advanced Agri-Industrial technology which has contributed to its success in Biofuel generation. Brazil uses modern equipment and cheap sugar cane as feedstock, the residual cane-waste (bagasse) is used to produce heat and power, which results in a very competitive price and also in a high energy balance (output energy/input energy). There should be focus on 1G mechanism of ethanol blending instead of 2G ethanol blending. Bio-fuel policy must be strongly backed by sufficient technology and production scale in order to be financially feasible and implementable. Biofuels programme in India has been largely impacted due to the sustained and quantum non-availability of domestic feedstock for biofuel production which needs to be addressed.